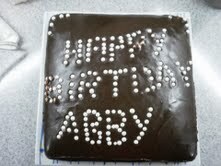 Yesterday was Abby's birthday. It was an absolutely beautiful day. Sunny, about 72 degrees, no humidity, mostly blue sky. Just like the day she was born 16 years ago. I feel very fortunate to have two fall-born babies since autumn is my favorite season. Bar none. The climate just can't be beat. The light is gorgeous. And after years of starting school in September, it still connotes new beginnings. But back to the subject at hand. 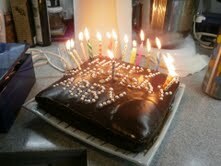 We are definitely a family of birthday traditions. Our custom is to artfully arrange the presents on the red chair the night before the big day. As soon as she wakes up, the birthday girl opens her gifts all at once, surrounded by her family. Breakfast is always vanilla ice cream with corn flakes. The choice of birthday cake belongs to the birthday girl but the family favorite seems to be Maida Heatter's Farmer's Daughter Cake: luscious vanilla cake draped with a thick layer of rich chocolate icing. This year we digressed slightly. Because of the early school bus, Abby chose to open her gifts at the end of the day -- wise move. I think she got an exceptionally good haul (if I do say so myself). 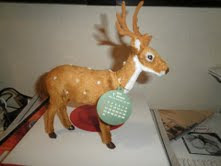 By far the weirdest present is this deer-shaped calendar. Crowned with a head of antlers, this buck (I guess) proudly sports the months around its neck like an award. Eve and I thought he would look very dignified standing on Abby's desk. Don't you agree?